The Orphans of the Storm® Annual Benefit Dinner is just a few days away: Monday, April 28 at 5:30 p.m.–with a special VIP tour of the new cat wing at 4 p.m.! Caliber the seven-year-old black Labrador Retriever mix is one good-looking pooch. When we were out on our walk around the shelter grounds, I was asked on several occasions who he was because he was catching everyone’s eye! Caliber seems to move in bursts when he’s on a walk. He’ll sniff something for a moment, then dart ahead a few feet, then sniff again. When there are so many new scents to smell, it seems like the right way to do it. Caliber is a pretty mellow guy when you let him off the leash, though. While we were in the run, he meandered about and seemed to enjoy just being out in the sunshine. Since he’s a middle-aged guy, a couple of nice walks around the neighborhood and some time in his own backyard seems like a pretty good deal to him. 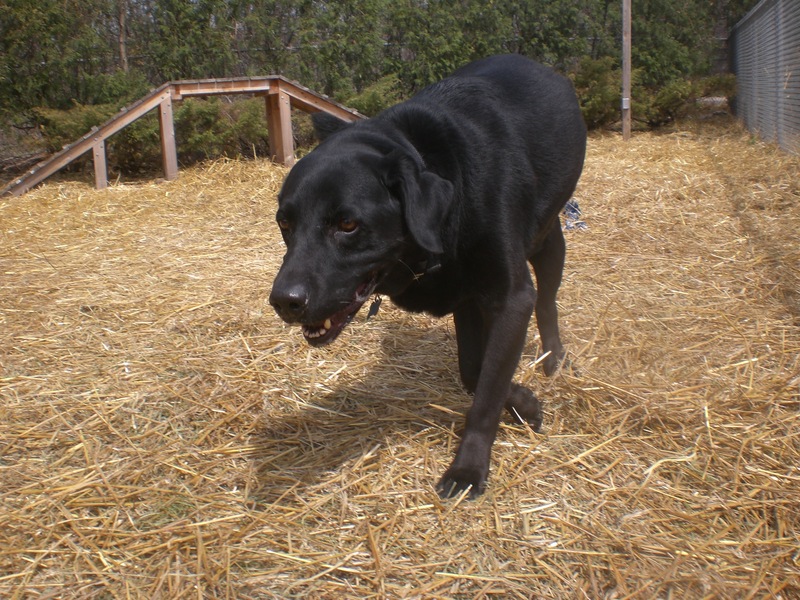 Don’t let Black Dog Syndrome keep him at the shelter for too long. If you’re interested in adding the most popular dog breed in America to your home, stop by the shelter and see if Caliber is the pooch for you. Elmo the two-year-old Pit Bull Terrier mix is super duper affectionate. 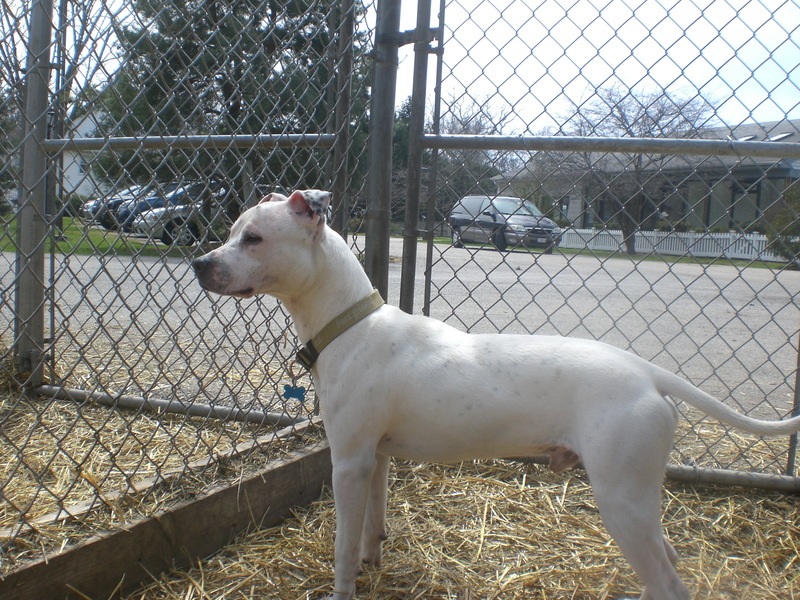 He’s on the smaller, skinnier side compared to other Pit mixes at the shelter, which is perfect for him because he is a complete lap dog (or, as much of him as can fit in a lap). He was busy exploring the off-leash run, but when he saw me sitting on the bench he came running over and launched himself right into my lap, then proceeded to cover my face in doggy kisses. Elmo has a unique look, which adds to his cuteness. 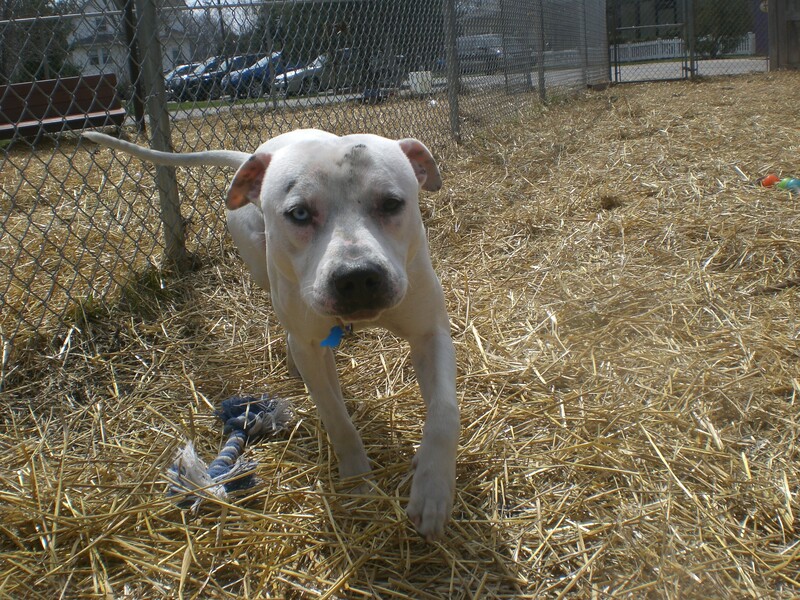 He’s mostly white with just a sprinkling of black spots, and he has one brown eye and one blue eye. Elmo is also an excellent fetch player. He happily chased the tennis ball and brought it back, dropping it on the ground to wait for me to throw it again. 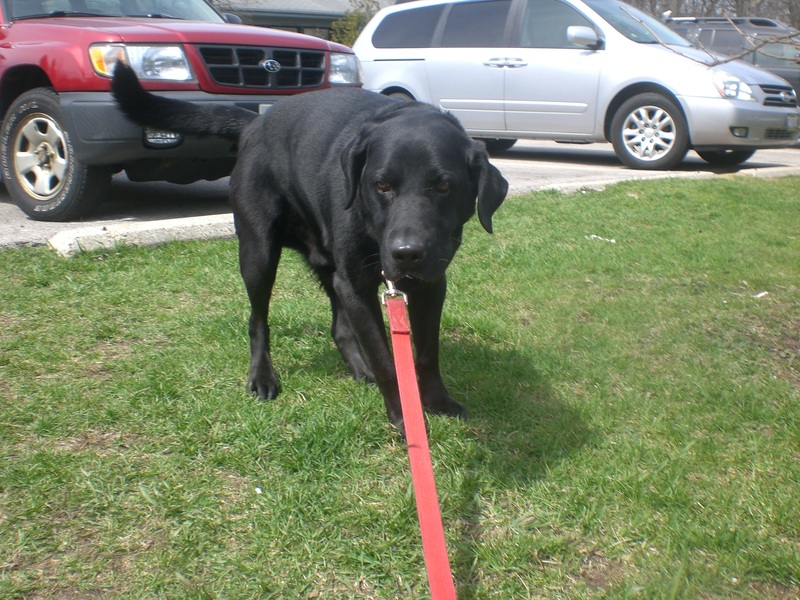 Elmo’s tail is wagging all the time and he is a great walking companion when he’s on his leash. If you’re looking for a playful cuddle buddy, come in soon to meet Elmo! Ivy the two-year-old Labrador Retriever/Pit Bull Terrier mix is such a cutie, and she has some of the softest fur I have ever pet. Luckily for both of us, she loves being showered with attention! When we got to the off-leash run, I knelt down to pet her and she immediately sat right at my feet and waited until I was done petting her before getting up and sniffing around. When I went to pet her a few minutes later, she did the exact same thing. 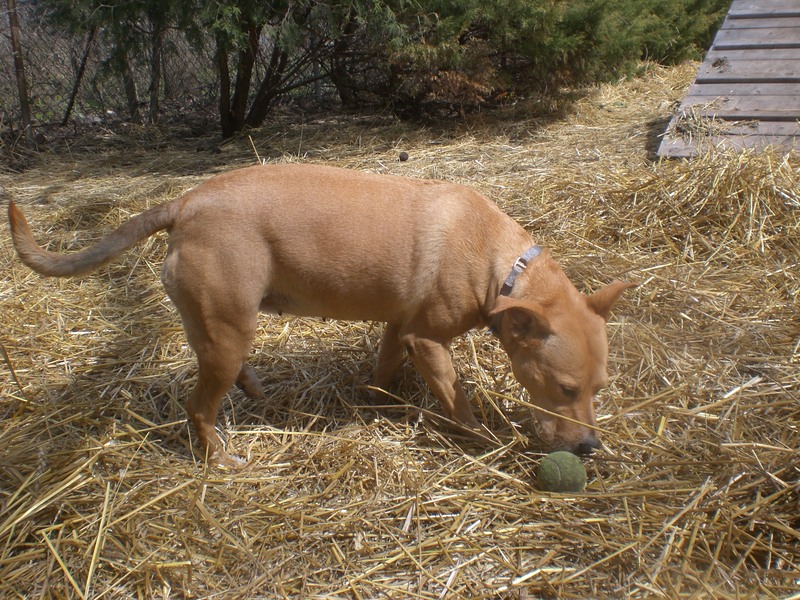 Ivy is another dog who walks well on the leash (though when it came time to go back to her kennel, she wanted to go in the opposite direction–it breaks my heart when they do that!). Ivy has adorable ears that perk straight up whenever she sees or hears something interesting. Although she barked at Gizmo when they had a fence separating them, she seemed pretty polite with him when they were both on leashes walking around. A sweetie like Ivy won’t be at the shelter for long, so come in soon to meet her! I also saw Nano (who greeted me right at the front gate–he was on his way to the Pet Showcase at Northbrook Court! 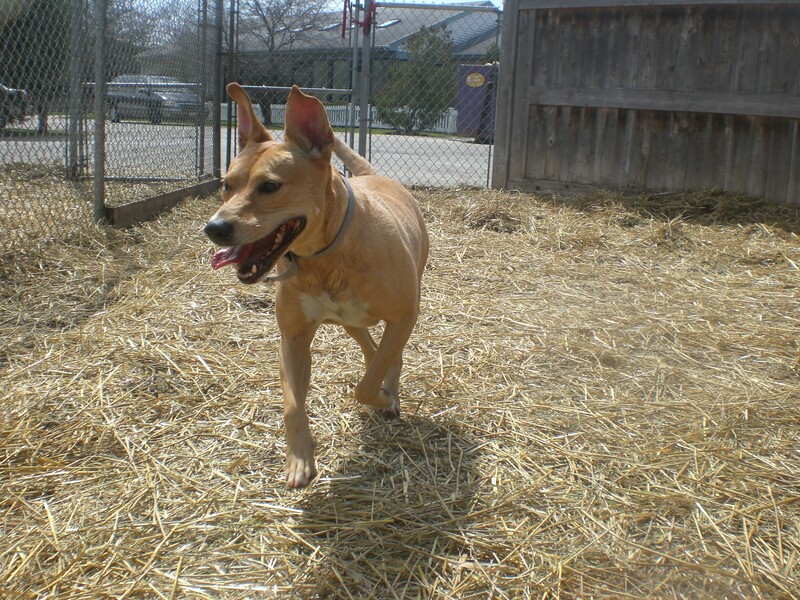 ), Dina, Javan, Maggie, Rosco (who would love nothing more than his own backyard to run in–you should see him go! ), Shasta, and Tiger. Posted by Meet the Pooches on April 24, 2014 in Dog Profiles and tagged adopt, animal shelter, animals, Chicago, dogs, Labrador Retriever, Orphans of the Storm, pets, Pit Bull Terrier.